Sink cabinets need to be functional, durable and stylish. Successful cabinet design relies on you identifying exactly what you want to accommodate in the sink base cabinet and choose a design that is sized for your purposes. Consider the size and mounting style of the sink you are using when picking a cabinet and countertop. Typically, a kitchen sink cabinet is wide enough to accommodate the sink insert, and has two doors of equal width. The cabinet under the sink is usually one large cabinet space. 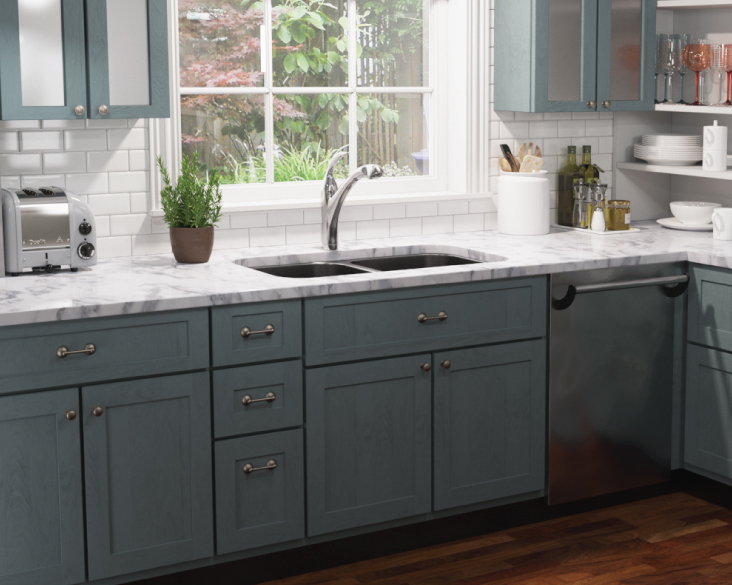 Drawers are normally not used for sink cabinets as they can interfere with the waste trap, water lines and connections and reduce accessibility to plumbing items. The typical height for a kitchen counter top is 36 inches above the finished floor. Allow for a toe space at the base of your cabinet of 4 inches above the finished floor and recessed 2 inches from the face of the cabinet. There are many cabinet sizes available, but the common depth is 24" and the width can range from 18"-48". Remember to allow 2-3 inches on each side for mounting. Important factors to consider when determining the size of your sink cabinet are the interior space requirements and how it will be utilized. Garbage disposals require a certain amount of space under a cabinet, so make sure to check the manufacturer’s guidelines. If you plan to store a waste basket or recycling bin under your sink, take into account their dimensions when selecting cabinet size. The interior of your sink base cabinet should be water resistant, or have a water-resistant coating. Melamine or polyurethane-coated wood are good options. Selecting hardware for your cabinets can be just as time-consuming as selecting the cabinet. Remember that the design of the hardware should be consistent with the overall design of the room. If you are having trouble finding the right finish of hardware, look at your curtain rods, chair legs, faucet and other fixtures to match. Examine your existing kitchen cabinets and fixtures. Take note of what you don’t like and what you wish you had to make the shopping experience less painful. How much storage space do you need under your sink? Make a list of everything you currently store and wish to store to help decide what size cabinet is best for you.